...and what about the WOW factor? So does a binoscope live up to it's expectations? Are the 'promises' made by observers that have compared binoscopes with mono-Dobsonian telescopes valid? What follows is an extract of some field notes I scribbled down on specific objects. Photo's come from the website the Sloan Digitized Sky Survey. Drawings are made by others as indicated. 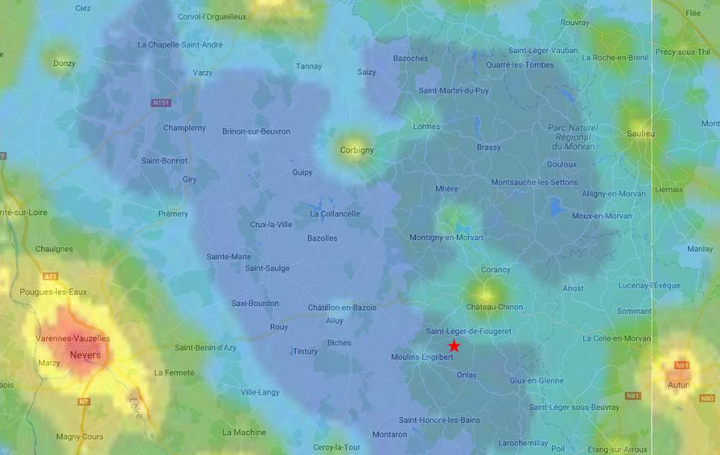 I am lucky to be able to observe in The Morvan, one of the last real dark areas in rural France, in fact one of the last dark spots in Western Europe, it seems. First light with the 2 x 13 inch binoscope under a dark sky in the Morvan. M13 is VERY impressive and floats like an island in a very dark sky! A bright beacon that just escapes on all sites from the oculars. Compared with the 16 inch telescope the normal 'flat' image appears to become 'wobbly', there is a distinct 3-D illusion. The large M13 nucleus actually lies ON a large flat halo of razor sharp stars, from which streams of stars escape, floating away into the inkblack space. Only now you understand where he word GLOBULAR comes from! This you can't see on photo's, such as the one below of M13. In fact, I find the visual observation of this globular MUCH MUCH nicer and more appealing. What happens when you close one eye, thus creating a mono-telescope again? You don't see much less all of a sudden, but the artificial 3-D feeling is gone instantaneously. I tested this on a number of objects and noted the same result. And with low power (61 x; 27 mm Panoptics) you can see NGC 6207 in the same view (upper left in the picture). A small, but bright galaxy. What always was called a stellar nucleus now becomes really stellar. A very concentrated light point. Surrounded by a clear halo. For the first time I note the beautiful shape of the galaxy. Elongated and partly seen on the side like a miniature M31. At 235 x, I clearly see a mottled appearance with differences in brightness are seen in the halo. Definitely much more than the previous amorphous faint spot of light. And then the dark lanes!! M31, in the direction of M110. With the 27 mm Panoptics (1.1º true field) the nuclei of M31, M32 and M110 are caught in one view. M32 has a stellar nucleus, but now for real! It is indeed almost a star! The two broken oval lines are a rough indication what I could see before with the 16 and 20 inch telescopes versus the binoscoop. The most prominent dark lane in M31 just jumps from the eyepieces, but also the second system of lanes is clearly visible. This is because the enormous halo is so obvious. It extends beyond M32. The picture below is obviously much more detailed than what can be seen visually. But, we're getting there..... The halo can't be seen in its totality, but scanning through the large field is some experience as well. The halo is very faint and I have never seen it this transparent with any mono-telescope. With scanning the halo suddenly drops away, the border between dark and faint light is sharp en very clear to see. This was definitely a WOW factor! What a beauty! Very clear to see that you are dealing with a spiral galaxy. Particularly impressive is the spiral arm that lies somewhat separate and that ends with the HII region NGC 604. This region is very bright, no filters needed. Despite the low surface brightness of the galaxy the spiral structure is very good to see. Also the a-symmetric nature of the galaxy. On M33 I find the low power of 61 x most appealing. You then easily note the many differences in brightness, emerging from the centre of the galaxy outward to the faint arms. It strikes me how faint these arms are. In fact, previously I only saw the brightest patches of the arms, close to the core of the galaxy, which is already quite something. But only now I clearly see how large the faint arms really are, almost filling the view. All of a sudden, M33 has become much larger! Also M51 gives an enormously detailed image. At 165 x the arms are completely separated. There is not so much an increase in brightness of the arms though. No, it appears as if the areas between the arms have become darker! The already mentioned increase in contrast with the binoscope has its effect within the spiral arms themselves! 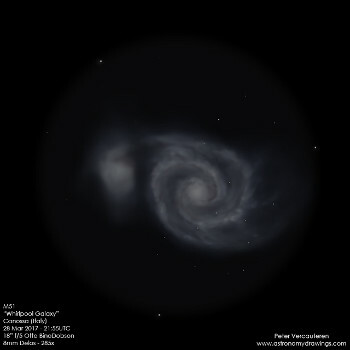 M51 becomes more of an atom model than the structured "blur" with differences in brightness. The sharpness is amazing. And here as well: when I look with one eye only, this effect is gone instanteneously. Yes, the spiral structure is still there, but gone is the blackness between the arms. However, what to say of Peter Vercauteren's drawing on the right, made through the 2 x 18 inch binoscope, as shows in the previous section? More impressive than I can describe! The Veil nebula. This is extremely impressive, particularly the head of NGC 6992 (NGC 6995), is amazingly beautiful: long feathers of light standing out squarely on the main part of the nebula. Contrast-rich filaments of light run through the view, clouds of light, smoke rings, all razor sharp. This I never saw before: in the 16 inch telescope for instance I now see much less of these details. It is hard to get enough of this! The Dumbbell nebula. Maybe the most appealing example. Whereas the image in the 16 inch mono-telescope is certainly very beautiful, bright and full of contrast, the image in the binsocope is much sharper and shows even more contrast. In the binoscope the halter itself stands out very sharp and the 'side-lobs' are brighter than in the 16 inch mono-telescope. What strikes with the binoscope is the sharpness of the borders between light and dark. The field of view is almost filled (at 165 x) with the nebula. Multiple stars are seen with more ease. The nebula shows many details and large irregularities in brightness. This is beautiful and WOW! At the left is a beautiful drawing of Michiel Boltjes, based on observation with a 20 inch mono-telescope. At the right is my drawing, based on observations with the 2 x 13 inch binoscope. The drawing of Michiel Boltjes is similar of what I can see with my 16 inch mono-telescope that was set up side by side with the binoscope for best comparisons. The Eskimo planetaire nebula in Gemini. I observed it extensively at ~275 x with both the binoscope and the 16 inch telescope. In either case the inner, somewhat irregular, bright ring was very well visible. This ring is detached from the central star and there is a dark zone in between. And between the first, bright ring and the outer layers of the nebula is another dark zone. This dark zone is much better pronounced in the binoscope. Also the inner, bright ring is better defined and sharper. The differences are most apparent without filter. With the binoscope the central star, the bright, innder ring, the dark zones and the outer layers are all better defined. With the 16 inch mono-telescope the inner ring is fused almost seamless to the diffuse outer layer. The differences are subtle, but very apparent when observed in the similar setting with the telescope or binoscope. At the left is a beautiful drawing from Kurt Christiaens, based on observations with a 16 inch mono-telescope. At the right my impression, based on observations with the 2 x 13 inch binoscope. 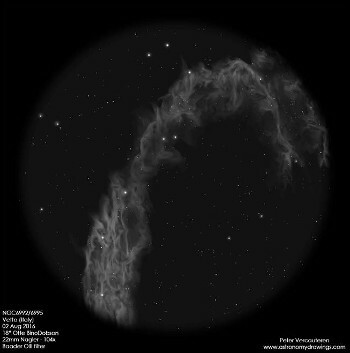 The drawing from Kurt Christiaens matches closely what I see through my 16 inch mono-telescope that was set up side by side with the binoscope for best comparisons. More observations are summarized below. I focus on aspects that strike me as more or less specifically linked to observing with the binoscope. NGC 891 Gx C 23. Outer Space Galaxy, 31 million light years away.Beautiful and very bright. The famous dustlane is very prominent, equally bright on either side of the dustlane. NGC 6709 OC HT 94. Nice, compact cluster, looks like two lobes with each ~10-15 bright stars and in between much weak starlight. Beautifully separated from the background. NGC 6804 PN Nice PN, somewhat oval in shape. Sutble differences in brightness. A weak star at the brim. With the bino I like the view better without filters, only then the central star pops in and out of view. NGC 7293 PN C 63. Helix Nebula. With the binoscope no averted vision is needed at all to see stars popping in and out of view with an OIII filter. More illusion that the nebula hangs in space than with a mono-telescope. With low magnifications breathtaking. NGC 7184 GX On photo´s you see a ring around the nucleus of this tilted spiral galaxy. With the binoscope I can´t see that, but it is clear that the nucleus is not normal: very bright and much larger than the usual stellar core. I also see two weaker systems: NGC 7180 and 7185, both with a concentrated nucleus, and separated by a string of stars. Beautiful assembly, with NGC 7184 as pretty special. M 2 Gb Spectacularly large and bright. As with more globulars in the bino, also now the core seems to lie above the halo of faint stars. String of stars escape into the dark. NGC 457 OC C 13. ET cluster, a real favorite, with any telescope. The two 'headlight' bright stars almost outshine the rest. The ET form with arms and a ragged body of weaker stars stands out dominantly against the background. Beautiful with 165x. With NGC 436 in one view. NGC 663 OC C 10. Horshoe cluster, one of my favorites. With the binoscope the two lobes stand very bright against the background. Many pinpoint stars with 165 and 236 x. A number of double stars. Nicely flanked by two smaller clusters, NGC 659 (HT 7) and 654 (SD 4). M 52 OC Beautiful with low magnifications. The cluster has an a-symmetric shape. Opposite the part in which the striking, bright orange star stands, the cluster appears flattened, streams of star escape from there as if the cluster is leaking. M 65, M 66, NGC 3628 Gb Magnificant galaxy trio. M65 and M66 are very bright and large. There are many details visible in both and the irregular shape of M 66 is obvious. But the most spectacular of the three is NGC 3628 (HT 58) that fills the entire view of the 10 mm Ethosses as a broad band. The dustlane can be seen with ease. It does not become much better than this!! M 57 PN Ring Nebula. With the binoscope I like it better without filters. The irregular brightness differences in the ring are obvious anyway. With filters of course brighter, but without filter the details appear more subtle. And the central star pops in and out of view! M 42 Nb M 42, ah well, what else then spectacular with the binoscope??? Particularly with low magnifications (27 Panoptics). Like with other nebula maybe nicest without filters. The contrast is very high anyway. Many details can be seen in the nebula. Without filters the trapezium and Theta 2 stand out. Very very beautiful, like with any instrument! M 15 Gb Another WOW feeling with the binoscope. A very bright core which lies ON a large halo of stars. The globular is somewhat irregular in shape, the halo is not round at one side. I see this for the first time with the bino. NGC 7619 GxCl Pegasus I cluster with NGC 7619, 7617, 7626, 7611, 7601, 7615, 7631, 7623. According to Huey, you can see ~15 galaxies visibly. I come to 8. NGC 7626 and NGC 7619 are both bright systems, with a large, concentrated core, but with much of a halo also visible. But in most cases details are lacking. Still, it is exciting to walk through this large cluster and piece together the identities. NGC 125 GxCl A compact and very beautiful cluster with NGC 125, 126, 127, 128 and 130. NGC 128 is brightest, has a small bright core and is somewhat elongated. It is flanked by NGC 127 and 130, but averted vision is needed to spot them properly. The cluster fits nicely in the field of the two 8 mm Ethosses. NGC 383 GxCl Brightest and largest member of the Piscus cloud. A beautiful assembly of small and weak galaxies, positioned almost in a straight line, a bit in the order NGC 384, 385, 382, 383, 386, 380, 379. Very nice to follow the line of this challenging and beautiful cluster. M 17 Nb Swan Nebula. Absolutely splendid with the binoscope. Most beautiful with 10 mm Ethosses (165) and OIII filters. The entire nebula comes into view. The neck of the swan is very clear, but also large portions of the nebula behind and under the swan are visible. I saw these parts never before. By coincidence the view is the bino is such that the swan stands horizontally, swimming from left to right. Astounding! M81 GX For the first time I can see that the two very transparent arms of M81 are separated from the rest of the halo, the halo already being very transparent itself. But between the arms and the halo there is definitely a darker part. When I close one eye this view is gone instantaneously. Most spectacular views with the 10 mm Ethosses. M82 GX Dark stripes cut through M 82 like in a loaf of bread. This in particular in the middle portion of the galaxy. In the rest you can spot large differences in brightness. Details are absolutely astounding!